Your kitchen should be an ant-free zone. From an ant’s perspective, there really couldn’t be a cozier place to call home. 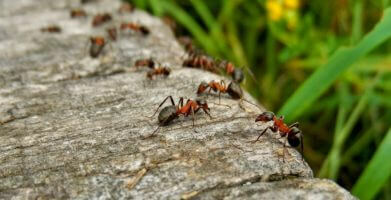 Understanding their point of view will help you get rid of ants. 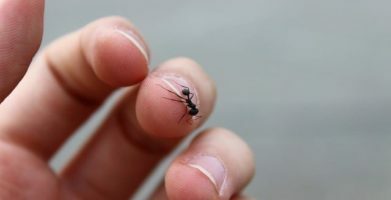 Imagine for a moment that an ant could tell you her favorite food, or how she always seems to know where to find your stash of sweets. Keeping them out of your kitchen would be so much easier if you only knew what made it so attractive. Since pavement ants are common kitchen invaders, we’ve done the imagining for you. We’ve profiled this pest so you can know the best way to keep them out. Junk food — I work out so much, I can eat whatever I want, and I totally do. Leftover take-out, the sticky sweet soda that was spilled on the floor, cake crumbs and crushed potato chips. I like it all! Pets — You love Fido and Fluffy because they’re so sweet and cuddly, but I love them because their food dishes are like a 24 hour all you can eat buffet. Girl power — Male ants are only good for one thing if you know what I mean, but me and my sistahs? We run the world! We supply our colony with food, maintain the nest, defend the queen and take care of anything else that needs to be done around here. Landscaping — Well-manicured lawns and grounds make it harder to get inside buildings. Let those shrubs grow so I can use them to climb inside. Barriers — I am strong, but sensitive. I don’t like walking across certain substances, like chalk lines or diatomaceous earth. Strong smells — Like I said, I’m sensitive. My sense of smell is very acute, and while it comes in handy to help me find all of my favorite junk food, your new perfume or fresh cut herbs can give me a real headache. Cleaning up — Whether it’s the crumbs on your kitchen floor or a deceased housefly in the windowsill, my friends and I are like a non-stop cleaning crew, and all of our services are free of charge. 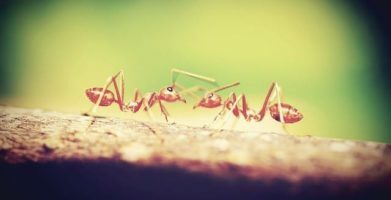 Sidewalk wars — Pavement ants are territorial, but you may not have noticed because you only care about what happens inside your house. Since we usually nest outside, you might have missed the rumble on the sidewalk, but we defend our turf against other colonies — and we always win! Tending to the queen — Myself and other worker ants like me are sterile — only the queen can have babies, so she’s really important. I’m really more of a giver than a taker. I’ll give you space in your home by keeping my nest outdoors, and I’ll just bring my crew of fellow worker ants over from time to time to clean up crumbs and any other messes we may find. Everything we do will be free of charge of course. However, I must warn you, we are a hungry crew — if you leave any leftovers lying around, or some sweets sitting out, we might just have to help ourselves. What I’m NOT looking for? I’m totally not interested in a perfectionist. If you missed a spot when you were sweeping, that’s okay, we’ll take care of it! And if you’ve tried to get rid of ants in the house before and it didn’t work, just give up, persistence doesn’t always pay off. I can’t stand it when we keep trying to forage for food and some crazy homeowner is all obsessed with getting rid of us! Can’t we all just get along? ***Editor’s note: If your answer is, “NO! We can’t all ‘just get along’!” that’s okay, we understand completely. That’s why EarthKind® created Stay Away® Ants, the only guaranteed effective natural repellent for ants. Stay Away uses the scent of essential oils to create an invisible barrier that keeps ants out. Your kitchen should be an ant-free zone. From an ant's perspective, there really couldn’t be a cozier place to call home. Understanding their point of view will help you get rid of ants. Imagine for a moment that an ant could tell you her favorite food, or how she always seems to know where to find your stash of sweets. Keeping them out of your kitchen would be so much easier if you only knew what made it so attractive. Since pavement ants are common kitchen invaders, we’ve done the imagining for you. We've profiled this pest so you can know the best way to keep them out. Junk food -- I work out so much, I can eat whatever I want, and I totally do. Leftover take-out, the sticky sweet soda that was spilled on the floor, cake crumbs and crushed potato chips. I like it all! Pets -- You love Fido and Fluffy because they’re so sweet and cuddly, but I love them because their food dishes are like a 24 hour all you can eat buffet. Girl power -- Male ants are only good for one thing if you know what I mean, but me and my sistahs? We run the world! We supply our colony with food, maintain the nest, defend the queen and take care of anything else that needs to be done around here. Landscaping -- Well-manicured lawns and grounds make it harder to get inside buildings. Let those shrubs grow so I can use them to climb inside. Barriers -- I am strong, but sensitive. I don’t like walking across certain substances, like chalk lines or diatomaceous earth. Strong smells -- Like I said, I’m sensitive. My sense of smell is very acute, and while it comes in handy to help me find all of my favorite junk food, your new perfume or fresh cut herbs can give me a real headache. 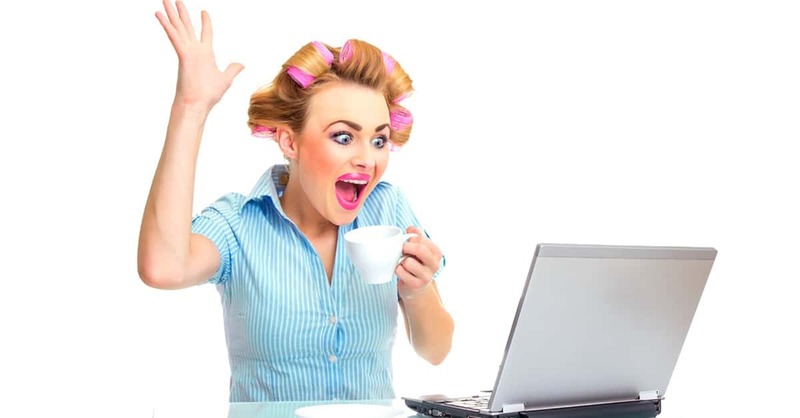 Cleaning up -- Whether it’s the crumbs on your kitchen floor or a deceased housefly in the windowsill, my friends and I are like a non-stop cleaning crew, and all of our services are free of charge. Sidewalk wars -- Pavement ants are territorial, but you may not have noticed because you only care about what happens inside your house. Since we usually nest outside, you might have missed the rumble on the sidewalk, but we defend our turf against other colonies -- and we always win! Tending to the queen -- Myself and other worker ants like me are sterile -- only the queen can have babies, so she’s really important. I’m really more of a giver than a taker. I’ll give you space in your home by keeping my nest outdoors, and I'll just bring my crew of fellow worker ants over from time to time to clean up crumbs and any other messes we may find. Everything we do will be free of charge of course. However, I must warn you, we are a hungry crew -- if you leave any leftovers lying around, or some sweets sitting out, we might just have to help ourselves. I'm totally not interested in a perfectionist. If you missed a spot when you were sweeping, that's okay, we'll take care of it! And if you've tried to get rid of ants in the house before and it didn't work, just give up, persistence doesn't always pay off. I can't stand it when we keep trying to forage for food and some crazy homeowner is all obsessed with getting rid of us! Can't we all just get along? ***Editor's note: If your answer is, "NO! We can't all 'just get along'!" that's okay, we understand completely. That's why EarthKind® created Stay Away® Ants, the only guaranteed effective natural repellent for ants. Stay Away uses the scent of essential oils to create an invisible barrier that keeps ants out. string(68) "Getting to Know the Kitchen Ant and The Secret That Drives Them Away"